Several weeks of travel have wrapped up with our visit to Guadalajara, Mexico. This town, with its adjacent municipalities has a population of over 4 million people, and is steeped in Mexican history and lore. Despite the huge population, many large parcels of land have been set aside for parks and green areas. In our visits to Guadalajara, we have always stayed in the community of Zapopan. 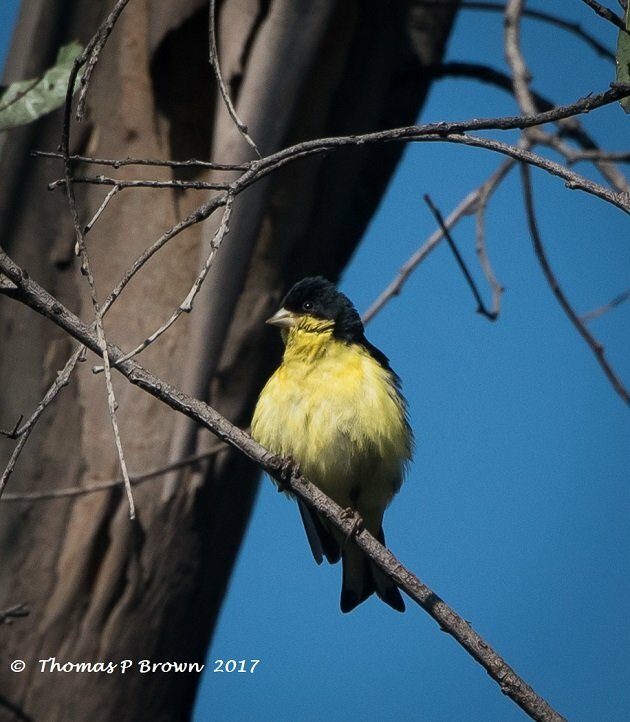 Up to this point, I have been drawn to Bosque De Coloma, mostly due to its location, ease of access, and some very nice diversity of terrain that supports a very large number of bird species. During this current visit, I was stopped at the park gate, because I was a “professional Photographer”, and was not allowed in the park without a permit. These permits were only available on weekdays, this was a Saturday morning, and there was a very limited number allowed. After nearly a dozen visits, this was a new wrinkle. The very friendly attendant also pointed out that the allocation for permits for that weekend we all taken. So, plan “B” was brought in to play. My wife, Jeanne had previously done a bit of research and found another as yet unexplored park, that was just a couple of miles from our hotel. So, we regrouped and headed to Bosque El Centinela, “The Centennial”. This park turned out to be an amazing gem. Much less developed that any of the previous parks and green belts that we had visited, it starts out in a very flat piece of land, with quite a few deciduous trees, and a large number of mature Eucalyptus Trees. Then the terrain slowly starts to climb in elevation, up into pine trees, small creeks and a bit of a pond formed by a small dam. 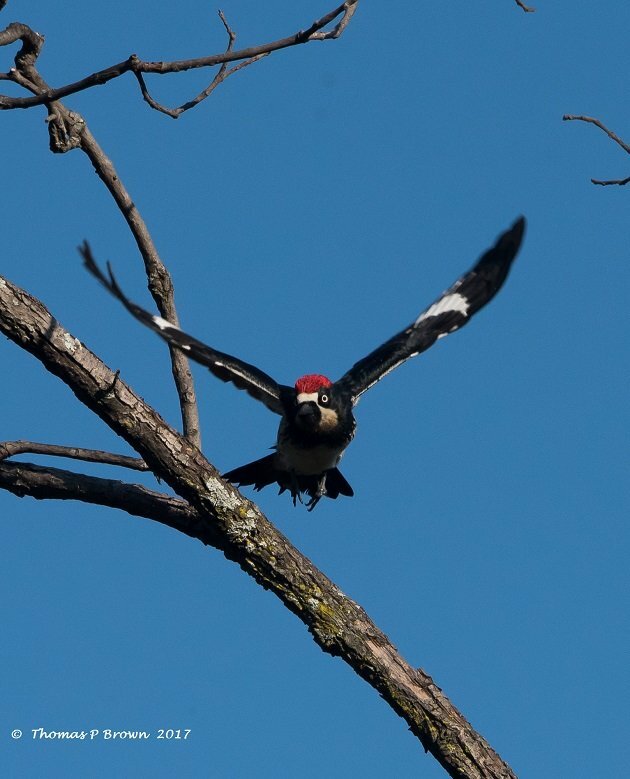 Almost immediately after climbing out of our taxi, I notice two things, one of the largest concentrations of swallows circling above the trees I have ever seen, and dozens of Acorn Woodpeckers chasing each other from Eucalyptus Tree to eucalyptus. The swallows turned out to be, as near as I could tell due to the sheer numbers, all Cliff Swallows. Literally hundreds of them circling and diving thru the air. 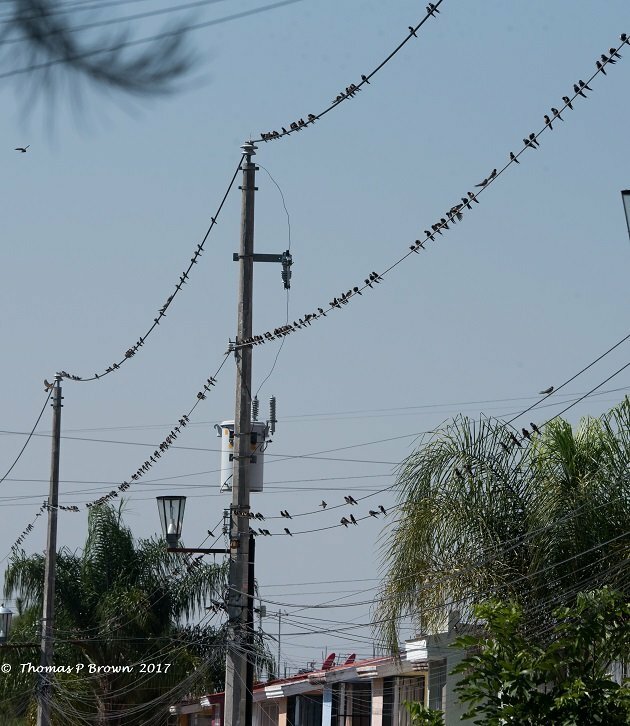 There was a pretty fair number on the power lines running near the park as well, but this was just a small fraction. It was interesting to find the Acorn Woodpeckers in this park, as despite what the Wikipedia page says, I never was able to locate any quantity of oaks trees, that would provide them with the needed acorns. 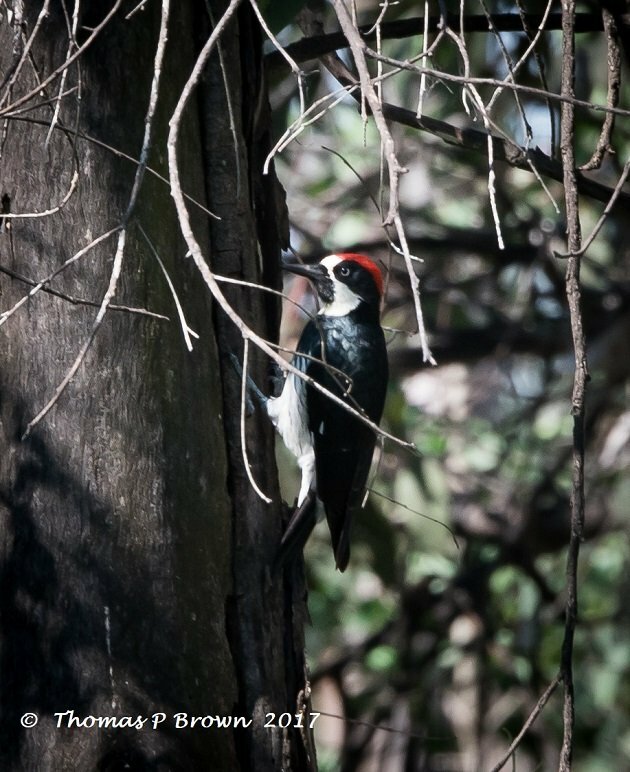 There were a few other woodpeckers to found in the area as well. Several Gila Woodpeckers, A couple of Ladder-backed Woodpeckers, and one beautiful Gilder Flicker. 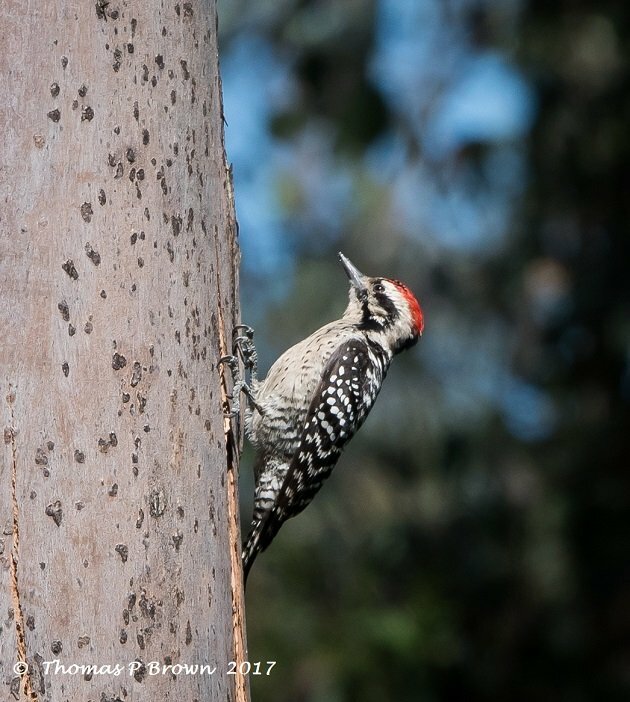 Here is the Ladder-backed Woodpecker. 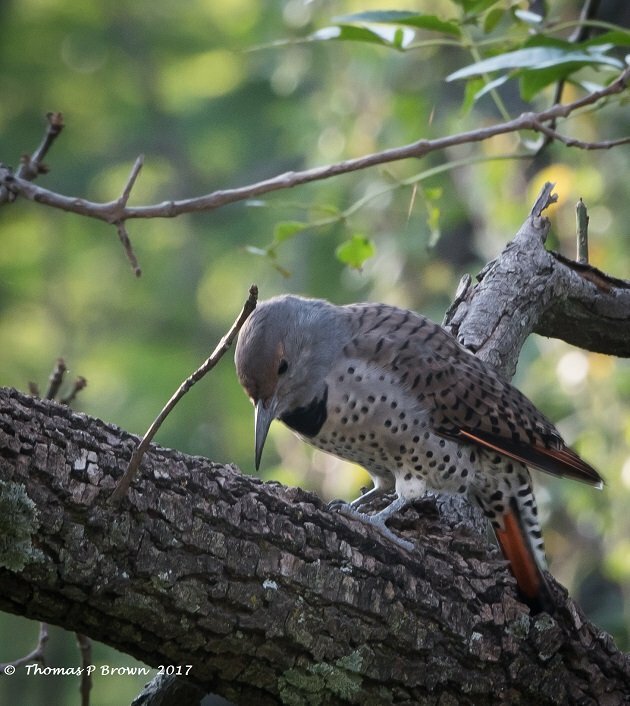 And the Gilded Flicker. And just in case there is a question of ID, this bird did have the tell-tale yellow underwings when it flew away. The one bird that I had truly hoped to track down, and was reputed to be found here in the park, was the Montezuma Quail. As I worked my way up the hill, I neared a small meadow, with waist high grass, and several trees down, providing nice cover. There was a bird, calling from some where in the grass, that I had never heard before. A loud, harsh “queeAAAK”. Using my very best stealth, and scanning the meadow, I spotted it. 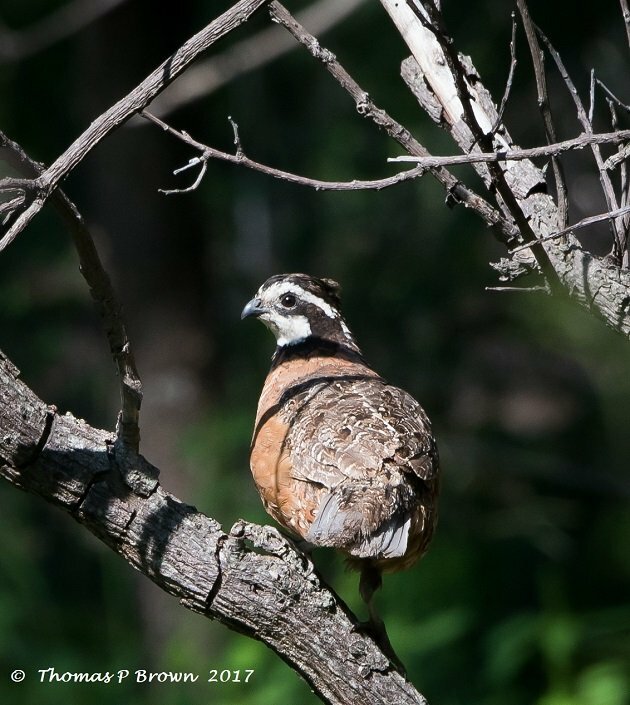 A quail had climbed up on a branch very close to the edge of the meadow. I was so excited…but, wait a minute. The face pattern was just not quite right…Dang, this noisy bird was a Northern Bobwhite, what the heck is that doing here? Now don’t get me wrong, it was very cool to see this bird, but it just wasn’t the species I had hoped for. I guess the Montezumas will have to wait for another visit. 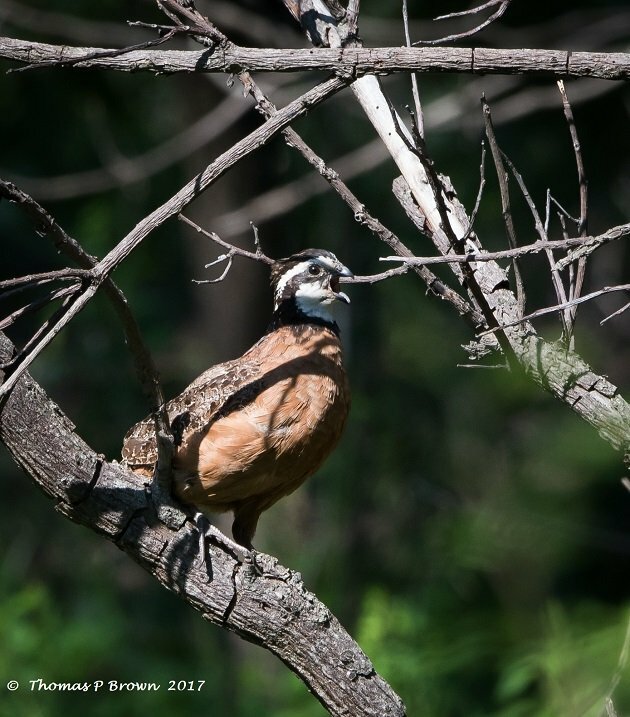 Here is a shot of the Bobwhite calling away…. As I turned to leave the grassy meadow, I caught a bit of movement just a few feet to my right. 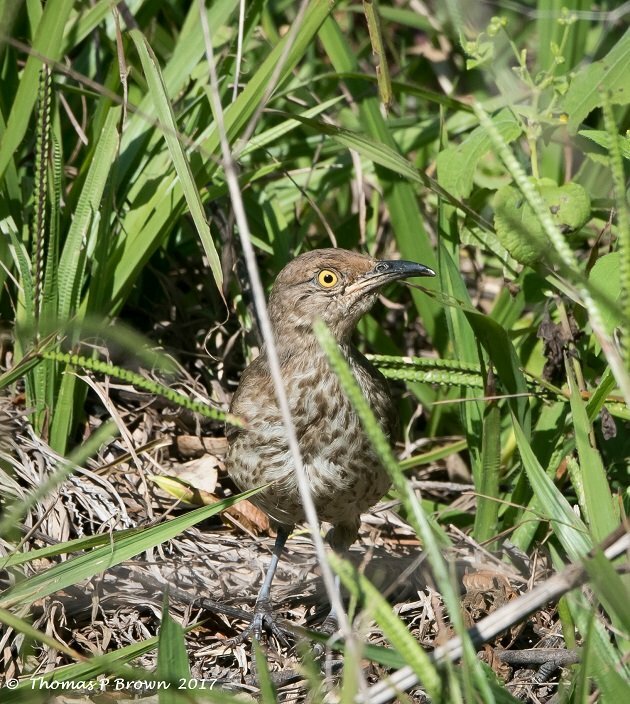 Peeking up thru the grass was a Curved-bill Thrasher. This bird even was accommodating enough as to jump right up on a near by branch so I could get a better look, and of course photograph. 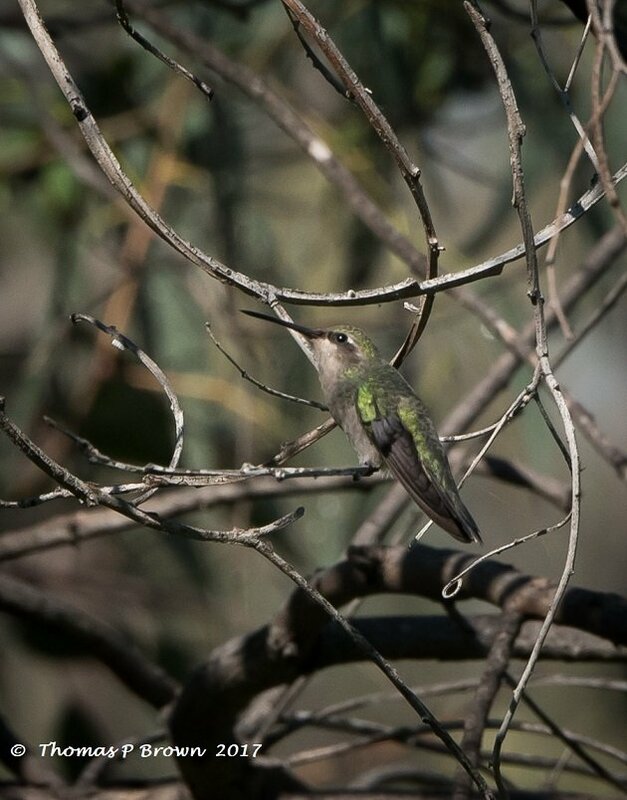 The area had a large number of hummingbirds but very few ever slowed down enough for me to make a good solid identification. At the top of ridge, I found this one, drinking water from droplets that had gathered on a spider web. This female Magnificent Hummingbird did settle down right next to me, and even chirped a few times. 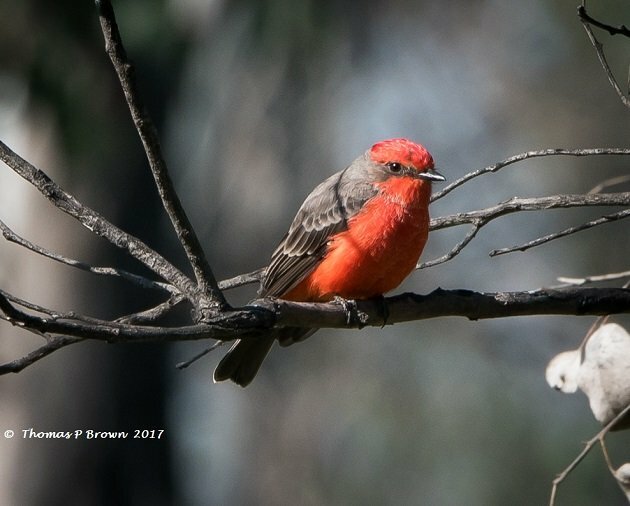 One of the birds that is found in large numbers in Bosque De Coloma is the Vermillion Flycatcher. But for some reason, the male to female ratio seems to be way out of whack. There were at least 10 females to every male. 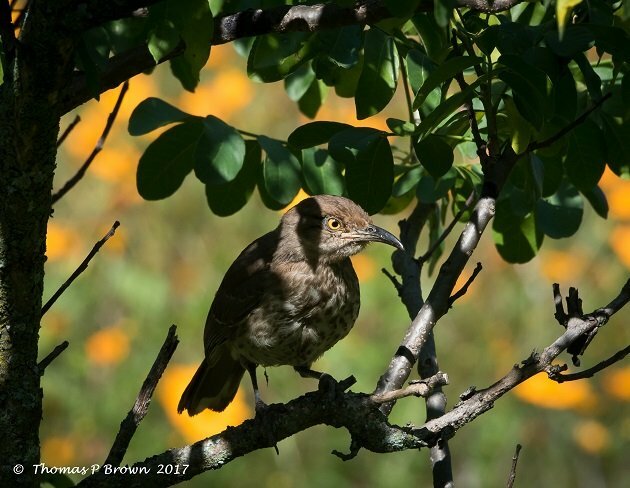 Here in El Centinela, it was just to opposite, as I saw at least 20 males and only one female all morning. Through out the park, Lesser Goldfinches and House Finches seemed to be every where. This male Lesser Goldfinch just got all puffed up for me, so a photo seemed appropriate. Bosque El Centinela is an area that I will return to again very soon. In the 4 hours I was there, I barely explored quarter of the park, and found 28 species. 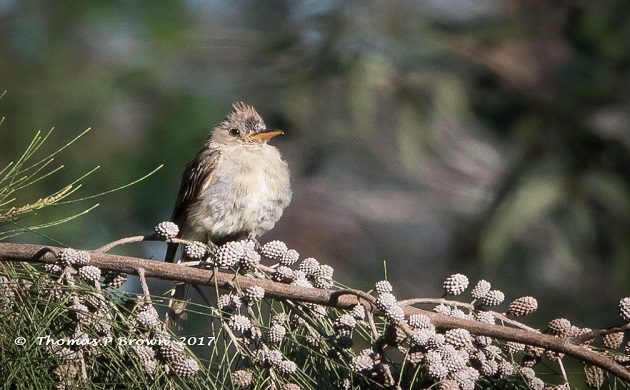 In another month or so, when all the migrants are back, so will I! 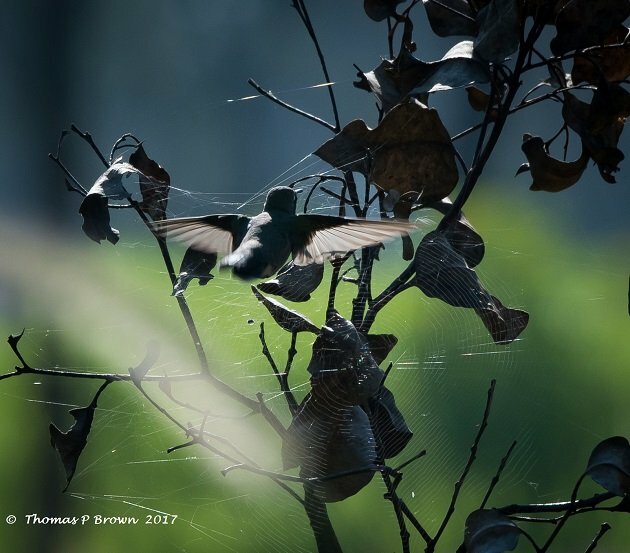 Where Are You Birding This First Weekend of October 2017?